Hi readers and welcome to 2014! I hope you had a wonderful time with your loved ones during Christmas and New Year. I had a great time reading Doctor Sleep by Stephen king, a great book! And I spend nice long walks on the beach with the girlfriend and had great (huge) dinners. 2013 was a really special year, we had some great clients at JSR and started with our first windows app. Also I started blogging, and thank you all for reading. I really enjoy reading blogs myself, two of my favorites are Nenad’s blog and a blog I follow that isn’t directly linked to Microsoft Project: the smart passive income blog by Patt Flynn. Patt has a monthly returning blog with statistics on how well he is doing with his online endevours. I would like to do something simular with this blogpost to give you an idea about how well my blog is doing. Since the launch of the blog in August I have had 1.803 views in total. 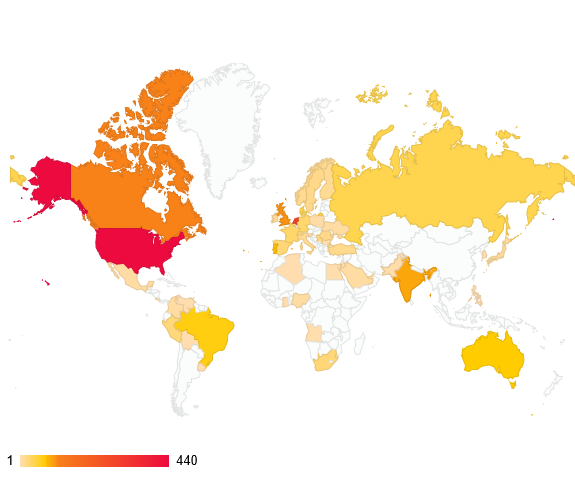 People from over a whoping 54 countries visited. The top five countries that visited were The United States, The Netherlands, Canada, The United Kingdom and India (with an honorary mentioning for South Africa that went from 0 to 25 visits in 2 weeks). There were 8 comments on posts in the blog itself, on LinkedIn (where I announce special posts) I got more than 20 comments. There were a few retweets but most traffic came from LinkedIn: 511 visitors. I started a book review post and a little shop for project management in December, the book reviews are well read: 126 views. The shop is visited daily, but no sales yet. On the best visited day (6 november 2013) I had a total of 140 views. There are 19 posts in total on the blog and 8 are in concept. I have 7 shares (no idea how that is measured) and there are five people following the blog, thank you!